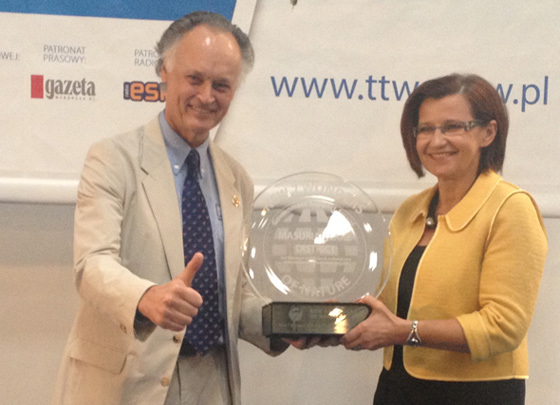 Bernard Weber, Founder-President of New7Wonders, presenting the New7Wonders of Nature Recognition Award to Anna Wasilewska of the Warminsko-Mazurskie Voivodeship Board in Warsaw, Poland, today. 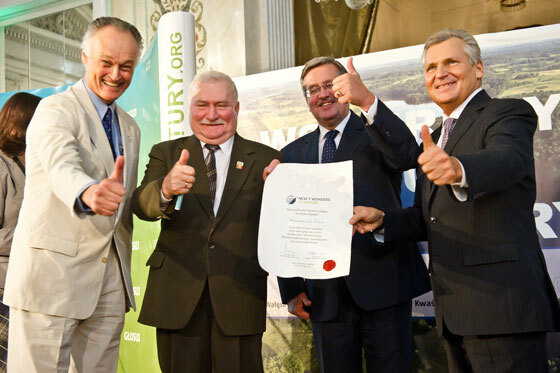 Bernard Weber, Founder-President of New7Wonders, presented the first New7Wonders of Nature Finalists Recognition Award to Poland’s Masurian Lake District today in Warsaw, the capital of Poland. The Masurian Lake District, one of the top 14 Finalists in the global voting campaign, received the New7Wonders of Nature Finalists Recognition Award “For the most visible local, national and transnational government support for the campaign“. The Recognition Awards honour the work of the Finalists that reached the top 14 group but did not achieve the New7Wonders of Nature status.